In a future that includes sea level rise and increasing coastal populations, shoreline defence is going to become increasingly expensive. Coastal ecosystems and their vegetation attenuate waves and stabilise sediments, providing cost-effective protection against flooding and erosion. The MI-SAFE viewer offers a first step in tailor made services that will help you to include nature-based solutions into coastal protection schemes. The data and map layers in the viewer are based on state of the art science. The viewer combines world wide coastal coverage and high-resolution local analysis. It is an automated coupling of Earth Observation, water level, waves and vegetation modeling. Advanced, with products and services that are available on request, aiming to provide tailor-made solutions to clients related to flood risk management and (vegetated) foreshore assessment. 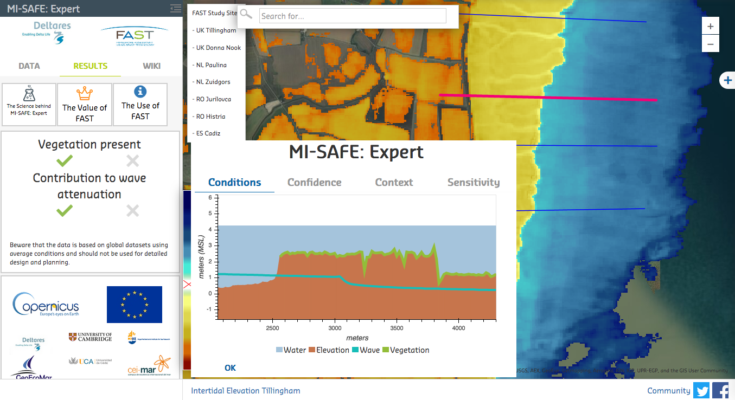 The MI-SAFE viewer has been developed with funding from the European Union under the FP7 program and is the final product of the Foreshore Assessment using Space Technology project (FAST, http://www.fast-space-project.eu/). The viewer is supported by a consortium of Deltares, the University of Cambridge, the NIOZ Royal Netherlands Institute for Sea Research, the University of Cadiz and GeoEcoMar. More information on the involved organisations and their roles in the development of the MI-SAFE viewer can be found at the FAST website: http://www.fast-space-project.eu/. In addition to (1) the Deltares Aqua Monitor tool, the first global-scale tool that shows water and land conversion, and (2) the Coastal Hazard Wheel App (CHWA), that provides data for coastal hazards like ecosystem disruption, gradual inundation, flooding, salt water intrusion and coastal erosion, (3) the MI-SAFE viewer adds high-resolution local analysis based on automated coupling of Earth Observation, water level, waves and vegetation modeling, using XBeach. For further detailed analysis of flows and water levels, waves, sediment transport and morphology, water quality and ecology, we offer(4) the Delft3D Flexible Mesh Suite (Delft3D FM).